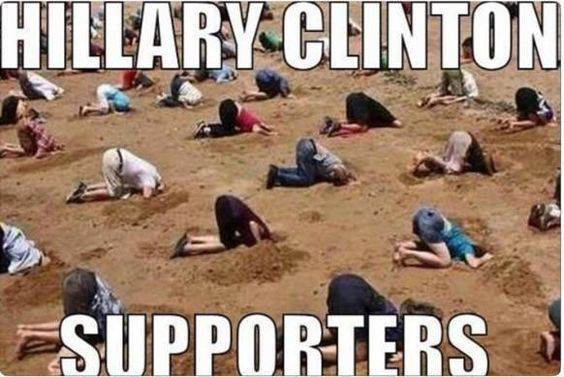 How Does Hillary Still Have Supporters? So with all of the troubles Hillary Clinton is having, to many of us it seems impossible to consider voting for her. She has lied, she has lied to cover lies, she has put our country at risk, she has cost many lives, many people she has been close to have mysteriously died, but still it seems highly likely she will become president. Let’s take a look at it from her supporters side and hear some of the reasons they are voting for her. Hillary gives women (and others) hope by pushing the boundaries. If a woman can be president, then maybe a gay person could. Not supporting this train of thought. Far from it actually. But this is the thought process for many. She is pushing the liberal agenda. Many people are fed up with the current system and feel that Hillary has progressive ideals and she will move things in a different direction, when actually she will move things in the same direction that Obama already is. She’s a woman. Let’s be honest here. Many women want to see their first woman president. And many men do as well. And that’s fine. There can be a first female president, just not her. If anything, let this be a lesson learned that this country is very open to a female president. If Hillary had not lied, had handled Benghazi differently, then she would have this presidential bid sewed up. She’s not Donald Trump. Bad way to look at it, but unfortunately this is how many voters on each side are seeing things. People, women specifically, absolutely cannot stand Trump and would literally vote for anyone but him. Are these reasons great? No, but they are still reasons and instead of questioning them, the GOP needs to move forward in building a campaign that addresses these questions and informs Hillary voters as to why these are terrible reasons to vote for her. What do you think the reasons people vote for Hillary are? Like and share on Facebook and let us know what you think.